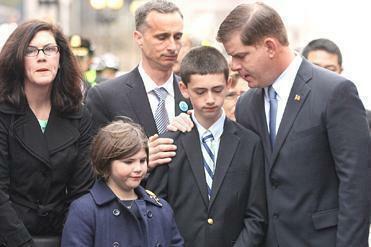 One year to the day after the Boston Marathon terror blasts, families of those killed attended a brief, quiet ceremony this morning at the bombing sites on Boylston Street. The private ceremony, in a light mist under gray skies, was attended by dignitaries including Boston Mayor Martin J. Walsh and Governor Deval Patrick. The busy commercial street was blocked off, and reporters were kept at a distance. Cardinal Sean P. O’Malley read a prayer. A bagpiper played “Amazing Grace” after the prayer while an honor guard stood at attention. The sister and brother of Martin Richard, 8, of Dorchester, one of the three people who died in the blasts, placed a wreath on a stand in front of the Forum Restaurant and stood in front of it for few moments. Then they rejoined their parents, who gave them hugs. A second wreath-laying ceremony was also held a short distance farther down the street, where the second blast went off. Public safety officer honor guards will be posted at the wreaths all day. The two bombs that exploded near the Marathon finish line on April 15, 2013, also killed Krystle Campbell, 29, of Arlington, and Lingzi Lu, 23, a Chinese graduate student at Boston University. More than 260 other people were injured. The suspects in the bombing also allegedly killed MIT Police Officer Sean Collier in Cambridge several days after the blasts. In a statement released today, President Obama recalled the people who were killed during the bombing, and also spoke of the now-familiar images of strangers and first responders helping anyone they saw in need during the attack.